Busybusybusy gearing up for raiding, getting achievements and so on, but I’ll just leave this here – hopefully before one of the spots I’m mentioning gets nerfed to oblivion. I was leveling my hunter’s engineering and decided to be stubborn – rather than making 1281627891693 Thermal Anvils, I wanted to at least craft something useful. So I made some guns for when I feel like leveling both her and my other hunter (and the third one I’m planning to create), and then I decided to make the Pandaria Wormhole Generator, because yay for engineering teleporters! Except to make that, I needed two Spirits of Harmony, and I didn’t have any. Bugger. I was going to just take the hunter to Jade Forest and kill some things, since she’s still lvl85, but the boyfriend was going to do his Klaxxi dailies, so I figured I’d tag along and do the you-kill-I-loot thing in case he got any motes to drop. The yellow and the green locations are places for daily quests. Yellow has Greatback Mushan (and, a bit further off to the side, Dreadspinner Tenders); green has Chillwater Turtles and Horrorscale Scorpids (and, a bit further south, Ik’thik Amberstingers). People kill them for Klaxxi dailies, and they’re skinnable, and since the quest items aren’t a 100% drop, there’s piles and piles and piles of bodies. I seriously couldn’t skin fast enough. Once we were done with the dailies, I still didn’t have enough motes, so off we went to see if we could find a suitable place for AoE farming, because hey, why not. Going mostly at random, we found the third area on the map. The red area is special. It has Ruby Venomtails – normal mobs that you can kill and skin – and, more importantly, they have Dread Scarabs. The latter come in packs of 5-6, have around 40k health each, die in 2-3 hits even to my lvl85 hunter… and each of them skins into 1-6 Exotic Leather, with the usual chance at Plump Intestines. In other words, they’re Deepholm Stone Bats v2.0. Considering how quickly the Deepholm bats got nerfed, I would suggest heading there sooner rather than later if you want to get some farming in. Not that it takes much leather at all to cap leatherworking these days, but still. Having unlocked everything unlockable on some character or other (well, except Filling the Moonwell, but as far as I know that doesn’t unlock any extra daily), I feel I have enough data to update my best Cataclysm dailies for gold post with the dailies that were added in 4.2. Yes, I could’ve just used Wowhead to determine the rewards, but I always prefer confirming things myself. tl;dr – Mount Hyjal is Isle of Quel’danas v3.0 (v2.0 was the Argent Tournament). There still are single dailies that reward more gold than the Hyjal ones, but counting travel time – and the fact that there are just so many of the Hyjal dailies, 17 after unlocking both Ancients and Armaments – these dailies most likely are the single most efficient way of earning gold through dailies. Doing all 17 dailies will give a total of 247 gold and 68 silver per day. Unfortunately, they can’t be easily clumped by gold rewarded, since you really can’t just pick and choose which ones to do the way you can everywhere else, so I’m going to sum them up by sections. Also, Wowhead has an excellent guide to achievements for the 4.2 dailies, so if you’re interested in achievements go take a look – it’s better than anything I could write up myself. Vigilance on Wings. Only worth doing for the achievement, especially considering how much of a pain it is. The Protectors of Hyjal rewards 20 gold, 26 silver. It’s always available (even on the first day of doing the dailies, once you go back outside after unlocking the Molten Front). Rage Against the Flames, Supplies for the Other Side, Releasing the Pressure, Relieving the Pain and Treating the Wounds reward 16 gold, 54 silver. You can only do one of them each day, at random. Call the Flock, Those Bears Up There, Punting Season, Perfecting Your Howl and Between the Trees reward 12 gold, 40 silver and 50 copper. You can only do one of them each day, at random; each has a follow-up quest, also rewarding 12 gold, 40 silver and 50 copper. All the basic Molten Front dailies reward 16 gold, 54 silver each. Some of them are always the same, some are random on a rotation. All dailies given by the Druids of the Talon and Shadow Wardens reward 16 gold, 54 silver each. Some of them are always the same, some are random on a rotation. Starting to see a pattern yet? You can only quest for one faction each day. Unlocking the Shadow Wardens will give you access to Avrilla’s daily. Unlocking the Druids of the Talon will give you access to Tholo’s. Both dailies reward 16 gold, 54 silver each; they are not mutually exclusive, but you will have to unlock both factions to have access to both. Completing Additional Armaments will unlock an extra daily. It’s always available to you, even if you haven’t completed all dailies for the Druids or Wardens for whatever reason (such as not completing Fire in the Skies to have a shot at Death From Above every day). Completing Calling the Ancients will unlock an extra daily. It’s only available to you after you’ve completed the Druids or Wardens dailies for the day, so if you’re deliberately not completing a specific daily, you won’t be able to pick it up. Enchanting materials are good, right? Well, not so much when you could earn more gold from selling what you disenchanted than it would cost to buy the result of the disenchanting. BoP blues from instances – especially Wrath-level blues as well as the blues from the starter Cataclysm instances, which disenchant into Small Heavenly Shards rather then normal ones. So you’re taking a weapon that vendors for 20g+ and turning it into a 5g shard? Well done you. BoE blues from instances. As a rule of thumb, I never roll “Disenchant” on these. Why? They often sell for vastly more than the shard would… and if they don’t, it’s easy enough to get them disenchanted anyway, since they’re BoE. Granted, I’m a little bit spoiled, since my main is an enchanter and I don’t have to ask anybody else to shard things for me… but still. BoE greens require a bit of thought, as the market for them is highly variable. Vanilla greens are often worth disenchanting – especially the higher-level ones that disenchant into Greater Eternal Essences and Illusion Dust; keep an eye out for well-statted low-40s plate and mail, though, as people will often pay a premium to kit their alts out in plate and mail once it’s available to them. TBC greens are worth disenchanting across the board, except for sub-60 greens with excellent suffixes, as these can sell very well (although the market’s shrunk a bit since Cataclysm, since the remodeled sub-60 quests give excellent gear rewards). Wrath greens will most likely be more profitable sold to a vendor this early on in Cataclysm due to the high availability of Wrath enchanting materials. Well-statted sub-80 Cataclysm greens should never be disenchanted. The two Hypnotic Dust or Lesser Celestial Essence you will get from disenchanting those will not make up for the 100g+ each those greens are worth on the AH. I cringe every time I see one of those get disenchanted in an instance. You don’t even need to memorize what items disenchant into what materials. Get an auction addon (Auctionator or Auctioneer), do regular scans and the information will be right in the item’s tooltip. So I’ve pretty much ran out of reasons to do dailies. I have the pet and both mounts from Tol Barad, I’m at the reputation cap with everything imaginable, and I’ve obtained every cooking recipe available from the tokens and got my Iron Chef achievement to boot (without either of the two guild-reward recipes /flex). So I figured I’d investigate and see which dailies are most profitable from a gold-making standpoint. I’m fully aware that doing dailies is by no means the most efficient way of earning gold when it comes to time spent vs gold earned, but what can I say – I find dailies relaxing. As you’ll see, some dailies in the list are from WotLK. If a specific WotLK daily is not in the list, you can assume it’s not really decent gold, and that’s why it got left out (for example, the Troll Patrol set of dailies in Zul’drak). If I’ve forgotten anything, do point it out to me, it’s been an eternity since I’ve done WotLK dailies that aren’t the Argent Tournament ones. I’m also not including jewelcrafting dailies, either the old or the new. From looking at Wowhead, the Dalaran jewelcrafting daily at the very least would deserve inclusion in the list – but I have no idea if Wowhead’s data is correct (it isn’t for several other dailies; I had to check the entirety of this list by hand). My jewelcrafting character is still on my old server and still level 80, so I have no idea how much gold the Dalaran daily would reward at level 85 and no way of checking. The list got long, so I’m tucking it in the extended entry. I’ve tried adding information on additional gold-earning and achievement potential wherever possible. Shortly before patch 4.0.6 hit, I read a post on Kaliope’s Crafting weblog (which I keep meaning to link from the sidebar) about the introduction of a cooking goodie bag, randomly containing Cocoa Beans, Noble Hops and Dry Yeast. The bags would then become the only source of these cooking reagents, which prior to 4.0.6 were freely available in unlimited quantities from the same vendors which sold recipes for tokens. So I went and stocked up, since I really hate having to buy crafting materials with limited tokens. Bought two stacks of each. Now I’m wishing I’d bought more. See, the cooking bag is apparently bugged at the moment. It’s theoretically meant to be on a rotation; right now, the only bag showing up on the vendors is the one containing only Cocoa Beans. Which means I sold my stockpile of Dry Yeast and Noble Hops for quite a lot of gold. If you also stocked up on them before the patch, I’d sell them now, before the bug is fixed. By the time they get around to fixing it, you’ll probably have spare tokens to buy the bag with if you desperately need them (I know I will – I’m just missing 6 3-token recipes, which means another two weeks of doing the daily with some moderate luck with 2-token quests). On a side note, two other cooking-related vendor items that may sell are Tropical Sunfruits and Highland Pomegranates. I had spares after using them in recipes to obtain The Cataclysmic Gourmet, since they’re sold in stacks of five, so I figured I’d toss them at the AH just in case – and they sold. For 10g each. (Each stack of five is ~2g or so from a vendor, not counting reputation discounts and the like.) It’s worth a try – even if they don’t sell, you’ve not lost a huge upfront investment. So I’m levelling a second hunter. I started because I wanted to see the goblin starter area, and then continued because the revamped old world quests are fun (and I’ve almost ran out of stable space on my lvl85 hunter, but there still are plenty of pretty pets I want to tame). Here, take my little goblin hunter alt. She has no heirlooms; the only advantage she has over a “normal” lowbie character is 4 16-slot bags. I sent her no gold, because I like my alts to be independent if I can at all manage it. She has no professions, either – well, she’s Herbalism / Alchemy, but her Alchemy is at 16 (because of the goblin racial – otherwise it’d be at 1) and her Herbalism is at 41 (I outleveled the gathering skill pretty fast, a problem I’ve already had on other characters), so she might as well have none for the purposes of this post since she’s making no profit from them. The extent of her interactions with the AH consists of a few visits a day, whenever I’m near one, to list things as quickly as possible then go back to levelling. How much gold does she have? Here, have a screenshot. Considering my gold-making method on her can be summed up with “sell everything I can’t use as quickly as possible”, that’s not bad. 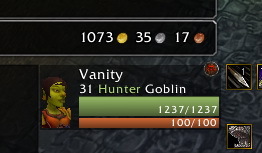 I would’ve hit 1k gold earlier (around level 25), but I spent about 100g on renaming two pets and another 200g or so on glyphs, since my scribe’s still on another server. If I had two gathering professions and I could be bothered keeping them up-to-date I’d be making even more gold, considering the current prices for lowbie herbs and minerals. And still, people seem to be having issues earning enough. I don’t get it. I can’t state this with 100% certainty since there are no hotfix notes mentioning this yet, but the awesome Savage Leather farming spot I mentioned a few posts ago seems to have been nerfed. It was working fine this afternoon – I was happily killing bats and skinning them; then I switched to my main for a while, and when I switched back, the bats were suddenly no longer skinnable. The basilisks in the area are still skinnable, as are the drakes in the north, but bleh. T’was good while it lasted. Now to find another good place to farm the rest of the Savage Leather I need, since Alieth has caught the arena bug and now we both need a PVP set posthaste.